It has been my honor each year to host the President’s Distinguished African-American Lecture Series in February as one of several significant events designed to honor the contributions of African-American citizens. In March, we strive to do the same to celebrate Women’s History Month by hosting events that celebrate the achievements of distinguished women. This year, however, our lecture series took a different form, enabling us to celebrate two events with one compelling speaker. 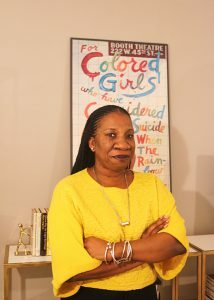 Tarana Burke, the African-American woman who founded the ‘me too.’ Movement, is making her way into the annals of “women who make history.” Because her schedule did not permit a February lecture, we blended the significant themes of both months into one powerful event, featuring a notable African-American woman speaking on a major initiative of national significance. With no disrespect intended to the importance of the theme of either month, we celebrated the spirit of both Black History and Women’s History months with one dynamic speaker whose energy, honesty and significance did not disappoint. After listening to the compelling reflections of Tarana Burke, I believe we can hold her in that same light: An individual with a powerful message, an insistent voice, and a passion that will not be quelled.